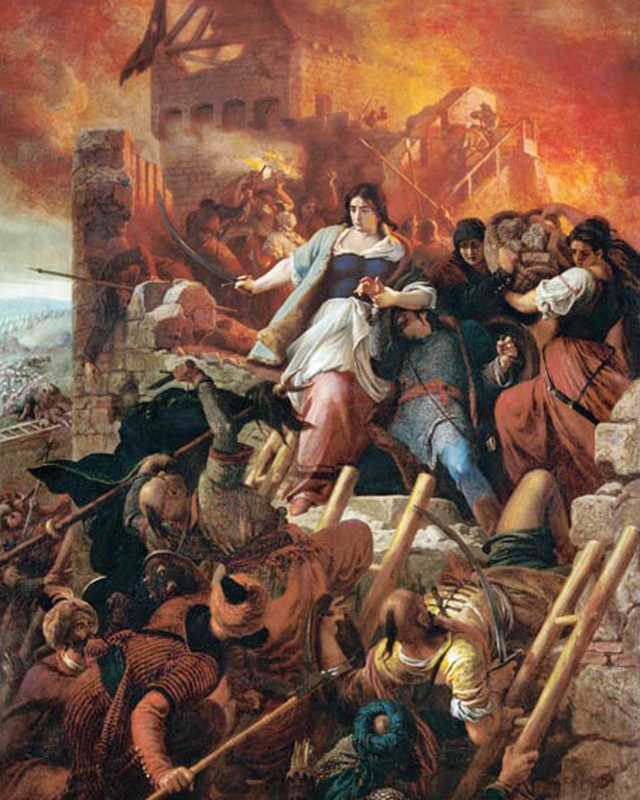 International Women’s Day seems like a good day to write about the courage of warrior women of Hungary. This painting by Bertalan Székely is titled The Women of Eger. It commemorates the 1552 Siege of Eger during the Ottoman Wars in Europe. The citizens of Eger, outnumbered by about 35,000 to 2,200, fought to defend the Castle of Eger from the Turks. The women joined the battle pouring down cauldrons of boiling water and tar on the oncoming enemy. Together they managed to claim victory that day. The story is well known by every Hungarian student. Unfortunately, later the Turks returned and occupied Hungary for 150 years. About 80 years later in Komarom county, our ancestor Kerekes Katlin courageously fought alongside her husband Édes Gergely and their sons*. In 1638 they were all rewarded for their bravery when Ferdinand III granted them nobility. Katalin was a large, strong, armed woman who ‘fought with the strength of an animal’. It was unusual for a woman to be granted nobility and in this case the privilege was to be inherited by both male and female descendants. Katlin was from Hajdúhadház, a settlement in a region known for its brave warriors. In 1604-1606,Lord István Bocskay of Bihar, led an insurrection against the Habsburg Emperor with an army of mostly serfs known as hajduk. According to Wikipedia, “As a reward for their service, Bocskay emancipated the hajduk from the jurisdiction of their lords, granted them land, and guaranteed them rights to own property and to personal freedom. The emancipated hajduk constituted a new “warrior estate” within Hungarian feudal society.” Their territory became Hajdu county. This painting captures the essence of brave Hungarian women like Katalin. *This post updated 19JAN2014. The translation of the Inconabulum, the Édes family history, provided more information about Katalin and her family. The earlier version of this post stated that she fought against the Turks in Komarom county. While Turk fighting may have been involved, it appears that there was fighting between nobles in and between Transylvania and the Hapsburg region of Hungary in the north. After the defeat at Mohács in 1526 Hungary was divided into three parts; the Ottoman Turk controlled south, Transylvania to the east and Royal Hungary under Hapsburg rule in the north. There are conflicting records of the other Édes men fighting with Gerő and Katalin. They may have been either brothers or sons of Gerő . In the Inconabulum she is referred to as Kató. This entry was posted in 1600s, About the Women, Édes, Hajdú, Hajdúhadház, Komárom and tagged Gergely Édes, Hajdú, Hungarian Genealogy, Kerekes Katalin, top10 by edesorban. Bookmark the permalink. One family saying about us as Hungarian women is that “we are strong like bull”. This is where it came from offers us proof. Amazing!